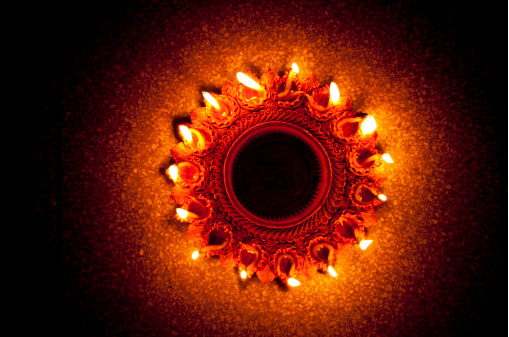 Deepavali is the festival of lights that is celebrated all over the world. The festival of joy is celebrated this year on Tuesday, 13th November 2012. This day the primary element Fire is at its peak with millions of oil lamps lit to celebrate the triumph of good (Lord Krishna) over evil (Demon Narakasura). Deepavali is also welcomed as harvest festival, marking the last harvest of the year before winter. Businessmen close accounts and begin new accounts thanking Goddess Lakshmi. In some parts of India, this day is the return of Lord Rama from his 14 year exile when he is welcomed with lamps (Deepa) that are lit row after row (avali). Jains celebrate this festival as Lord Mahavira’s nirvana while Sikhs celebrate it as the release of their sixth preceptor Guru Hargobind Singh. This day the three or two generations of a family get up early in the morning, have oil baths and wear new clothes. Women get dressed in their best colorful saris. Oil lamps are lit and the house and the site decorated with them. Prayers are offered to gods and family elders and guests welcomed. Children and the young heart play with firecrackers, activating in the process fire power all over! Deepavali is a festival that brings together different generations of the family (and business) to tell the world that fire power need not always create aggression but also conduce to assertive harmony. Chandi Homa performed on this day can contribute to enhanced finances, better health, success in wordly matters and wipe out inimical forces. Here are tips you can take to make this festival of lights safe, secure and significant for you and your family. Clean your building, the rooms and the corners of each room with care. Draw the sacred Om (in Sanskrit) on the main door with sandal paste. Let the height of this very powerful syllable be based on your hasta — bottom of the elbow to the top tip of the middle finger – one third hasta, half hasta or one hasta height. Apply turmeric and kumkum on the main door frame. All the above can be done the previous evening. Get up at Brahmi Muhurtham (about two hours) turning to the right. Elders can light the crackers (facing any direction) in the northeast and southwest of their compound. Take care to see that you do not take your elders or children by surprise by suddenly bursting crackers. Treat your family (and guests) to a sumptuous lunch. Recite or listen to Durga Saptashati in the evening. Light oil lamps in the night outside in the compound in the front yard (if permitted by authorities).